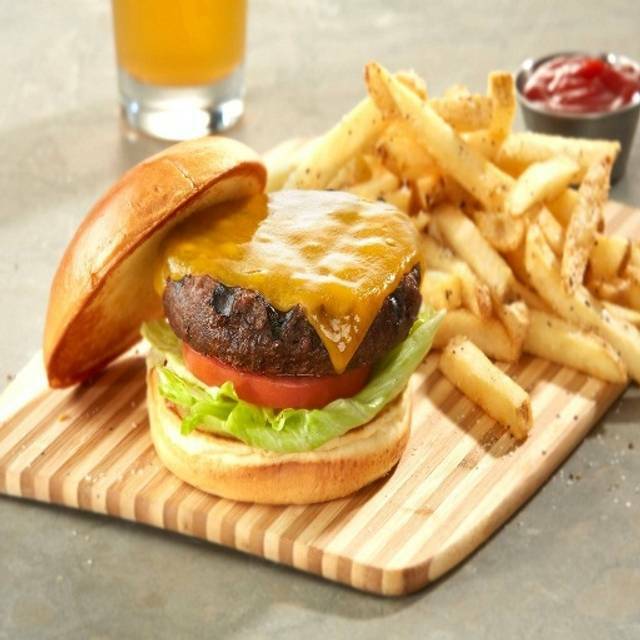 You must make reservations at least 5 minutes in advance of the time at Gordon Biersch Brewery Restaurant - Baltimore. Valet parking is complimentary Sunday-Thursday after 4:00 pm, only $7 Friday and Saturday after 4:00pm. Had 2 beers which were excellent. Loved it! Everything was delicious! It was a very peaceful environment and I would definitely recommend it! My parents came to town and we wanted to celebrate me buying my first new car! First time visiting this restaurant. It was a great place. The food was good, a great selection. Service was excellent with attentive waiter. Prices were great. I would recommend this place to anybody. Managed to book online. Beers locally made and full of body. We came in with our kids, neither the woman who sat us offered us a high chair or the waiter, that was weird. The shrimp and mango tacos were terrible the tortilla was so dry on them you could barely bite it and there was no mango even on them maybe 2 tiny pieces out of 4 tacos. Kids meals were basic it was just kraft Mac n cheese. The fire alarms started going off because of all the smoke in the kitchen. Service was mediocre, they are very slow. The only thing good was the beer otherwise don’t eat here!! Celebrating a 90th birthday party. Our group of 20 family members had a great time. Waiter was great. Food was good. Would recommend. Simone was great and on top of everything when I dined. I ordered some sliders, calamari and some cocktails. Just meeting a new friend for a meet and greet! Perfect setting not a lot of noise for good conversation. Great atmosphere. Construction and parking sucked. Service was okay, interruptions could have been minimized. Food was good. Gordon Biersch is always a good experience. The menu has many options and the food is plentiful. Service is usually very good, but this particular visit it was clear they were short staffed. That said, our waiter was very pleasant....which is a credit to him as he was the only wait person in the large section of the restaurant. They did not read the notation that it was my husbands birthday. The lighting at our table was unreasonably bright (we opted not to take pics). It was singularly the brightest table in the room. They weren’t able to adjust it. The fries and woodford reserve steak was good. The other meals at our table of six was not memorable. Service was terrific. Food was good but not great. Nothing on the menu was anything you couldn’t get at one of a bunch of other places and that might have been fine if the food was better than just pretty good. Service was prompt and friendly. Beer (tied Hazy IPA) was quite good and a good example of its style. Was a nice place but nowhere I’d hurry back to. Food was great. Bourbon salmon and seared ahi tuna more than met expectations. Beer selection a big plus. The one big negative: how you can serve the entree before the appetizer? I don’t care if that is the norm, to serve the dish when it is ready, to me that is not acceptable. Get the timing right. Otherwise a nice option for inexpensive eating on the Baltimore waterfront. I went to this restaurant because it was the preference of the person I was dining with. It is a good place if you are a craft beer lover and looking for foods to accompany a beer experience. Nothing special about this restaurant. I doubt that I would return because it’s just not the food experience that I enjoy. Our group was welcomed and given a nice spot where we could talk and enjoy our food. Nice servers who genuinely wanted us to be happy. I enjoyed my visit there this past Sunday. The food was great. My one complaint is the drinks were very weak. I had ordered two drinks, the 1st one was a pineapple and mango Margarita. It didn't taste nothing like a Mar. Instead it looked and taste like a Mojito. The 2nd drink was a Mai Tia and it did not taste as though it had any alcohol in it. The drinks were terrible. Upon my next return, I will be ordering any alcohol beverages. The waiter was very professional and attendant. Good service & good food. I’ll be back!! The server ruined the entire experience. Although the restaurant was nearly empty, we waited more than 10 minutes to have our drinks taken and he then forgot one of the drinks. We had to ask another server for drink refills. Casual meal for large group during holiday season. One of the only moderately priced restaurants to accept reservations for groups over 10 people. Really good server kept things moving. Good brews. Liked everything but the ahi tuna, and way too much garlic on the fries. The service was terrible. We had planned to have dinner but after waiting forever for the waitress to take our dinner order following drinks, we paid for the drinks and went elsewhere. Just beer and waiter were good.Unacceptable food.Twenty five minutes was waiting for appetizer.Blue crab deep:no crabs founded,only cheese.Too much salty were everything.It was my first and last visit. It’s a consistently great place. Garlic fries are out of this world awesome. Beer is great. I love the shrimp appetizer and the Gorgonzola ribeye. They never disappoint. We love this place for the atmosphere, food, and friendly service. We’ve made it our spot to go when we’re in the city. October fest! Great time with friends. Good food. Great prices. Valet parking. Server was attentive and on top of things. Food was absolutely delicious. Our party loved the calamari, the asiago garlic fries, the Kobe burger, the cajun pasta, and the house pinot noir (Italy) was wonderful. I was very disappointed in the service! We had a party of 10. They placed us in a table in the back which was fine. There was not a lot of people in the restaurant nor on the patio. Our waitress never refilled our glasses. Never collected the menus and she took our order for apps but never cleared the plates before lunch. We collected our plates and put them on the other table with our menus. We had to tell the person who bought out our apps to find our waitress so we could place our orders for lunch. It was not just our table a guy came after another waiter tell him to just give me the bacon because his burger is getting cold and he could not wait any longer. The service was so slow. Well usually we have a good experience but not this time. The food was average and server seemed more interested in hanging out with other servers. And we were overcharged on almost everything on our bill. Thankfully we looked at it before leaving - we were charged for carafes of wine when we ordered glasses (in order to get the Happy Hour price). Seemed like a fishy way to try to run up the bill without us noticing. Will need to find a new place to watch Ravens games. Not a pleasant dining experience, unlike what we normally have when we visit Baltimore. Beer flight was exceptional. But every one of the 4 cocktails we ordered were disappointing. Seared tuna was ice cold, almost frozen. Ribeye with gorgonzola should've been called Gorgonzola with a little ribeye, since the cheese was sooo overpowering. Pan-handler walked into restaurant unnoticed and began harassing customers. We skipped dessert and opted for check. Our waiter, on the upside, was very knowledgeable and very kind, almost made up for the not-so-great food/drinks. Not an overpriced place, chalking it up to just a bad night. The food was good - a little on the spicy side with all the fresh garlic, but it was very good. I ordered the grilled chicken and received a mountain of garlic fries, a mound of green beans, and one small chicken breast. I would have been happier with a lesser amount of the sides and a larger piece of chicken (or two small pieces). Mercedes, the hostess was fantastic. I mentioned it was a birthday trip for my granddaughter when she was seating us...and after dinner a lovely dessert appeared! She also facilitated signing up for rewards program. She is a gem! I had a great time. The food and service was good. They didn't have substitutes for pork when it came to brunch, but other than that you're all good. The best part was our appetizers and the mango tea. The fish tacos and tuna were dry. My fries were fried hard and while another’s was mush with too much garlic. Not worth the trip of paying for valet. Definitely had better in that area. this restaurant is simply a fraud. They slinkingly added my bill a day after my payment. I tried to negotiated with them on the phone several times. They promised to call back, which didn’t ; and admitted it was a overcharge and promised to inform the bank, which I highly doubt as I haven’t see any process in the past 7 days. So the only thing I can do is to suggest: my friends, be careful with the GB! We went for restaurant week. There were not very many choices for enters and I ended up not even doing the restaurant week choices. My aunt ordered a medium steak and the steak came back well done and dry. The waitress did take it back no problem and then came with something better. We were seated next to the pay station where all the waiters meet, so it was a bit loud. This place would be fun prob for an after work happy hour, but not so much for dinner.